The 470 is truly one of the best designed thermal infrared imaging radiometers of all time. This unit offers color imaging along with super accurate temperature measurement, on board floppy disk image storage, and on board magnification (zoom) features. Now discontinued, SPI has a limited supply of used models for Rent or Sale. If you’re looking for a very low cost, portable thermal imaging system to carry out your condition monitoring surveys or R & D applications, a used Agema / FLIR Systems Inc Thermovision 470 infrared cameras are a perfect choice. The Agema Thermovision 470 and 450 model infrared cameras were some of the first commercially available radiometric systems used in industrial applications. These reliable machines have been around for many many years. Now they are only available as used models being long discontinued by FLIR Systems. The 470 and 450 infrared cameras are very large by today’s standards but they do offer some unique features that are hard to find on modern infrared cameras. 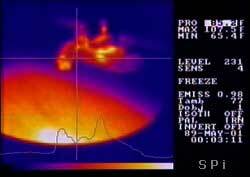 The units are scanning systems rather than focal plane array thermal imagers. They also operate in the 2-5 micron wavelength range but are still uncooled technology. SPI maintains a very limited supply of 470 systems for rent or sale. Contact us for latest inventory. Built for field use and with a proven track record within the condition monitoring market, these are among the most reliable and most accurate cameras you will come across in the infrared business. Industrial and factory inspections are what the IR470 thermography camera’s heart and soul was built on. The Rugged 470 can be used for a whole range of applications in many different industries. This portable unit offers high sensitivity and ease of use. The 470 is built to operate in demanding environments, such as offshore applications and steelworks. the splash proof, bump and vibration protected 470 can be operated even in areas where electromagnetic fields are present, for example, close to induction furnaces.